Former Alabama running back Tyren Jones, shown here as a redshirt freshman in 2014, will soon be back in the Southeastern Conference after committing to South Carolina. Alvin Kamara is having a successful life after Alabama in Southeastern Conference football. Tyren Jones is hoping to do the same. Jones, a tailback who was dismissed by Crimson Tide coach Nick Saban last March, committed this past weekend to South Carolina. The 5-foot-9, 212-pounder played this past season at Hutchinson Community College in Kansas, where he rushed 105 times for 655 yards (6.2 per carry) and five touchdowns. "Everything fit me with them as far as coming in and playing," Jones told The State newspaper in Columbia, S.C. "I have a good relationship with the coaches, and with the system itself and the opportunity for me — I love it. I loved everything." Kamara left Alabama after redshirting the 2013 season and transferred to Hutchinson, where he rushed for 1,211 yards and 18 touchdowns in 2014. This past season with the Volunteers, Kamara had 107 carries for 698 yards (6.5) and seven touchdowns as the primary backup to Jalen Hurd. The Gamecocks do not have such an established tailback, leaving the door open for Jones to start right away. South Carolina, which is undergoing the transition from former coach Steve Spurrier to interim coach Shawn Elliott to new coach Will Muschamp, has the nation's No. 27 class of commitments according to 247Sports.com. ESPN ranks the Gamecocks 28th, while Rivals.com has them 32nd and Scout.com ranks them 37th. "Before Will Muschamp got there, South Carolina had just a brutal class, but they're going to be OK," longtime analyst J.C. Shurburtt said. "If you look at Muschamp and his staff, they've got two national recruiters of the year (Bryan McClendon and Lance Thompson), and they had never had one before. They're going to be OK this year, and they could be really good in '17." Jones is from the Atlanta suburb of Marietta and was a part of Alabama's 2013 signing class that had four tailbacks — Derrick Henry, Kamara and Altee Tenpenny were the three others — ranked among the nation's top 100 overall prospects. Henry easily has been the most successful of the bunch, winning the Heisman Trophy and setting a SEC single-season rushing record for the 2015 national champions. Then there is the tragic tale of Tenpenny, who was dismissed from Alabama and then Nicholls State, a Championship Subdivision program that booted him in October after a felony weapons possession arrest. On his way home to Arkansas following his dismissal, Tenpenny died in a single-car crash that was ruled accidental. Jones was arrested in March 2015 for marijuana possession, which was the final straw with Saban. "Tyren Jones was indefinitely suspended from the football program early in the semester," Saban said in a statement released after Jones' dismissal. "He was given an opportunity academically and from a team rules standpoint, but he failed to do any of the things necessary to comply with the rules of the Alabama football program. He was dismissed from the team when he refused to follow the parameters given to him for reinstatement." 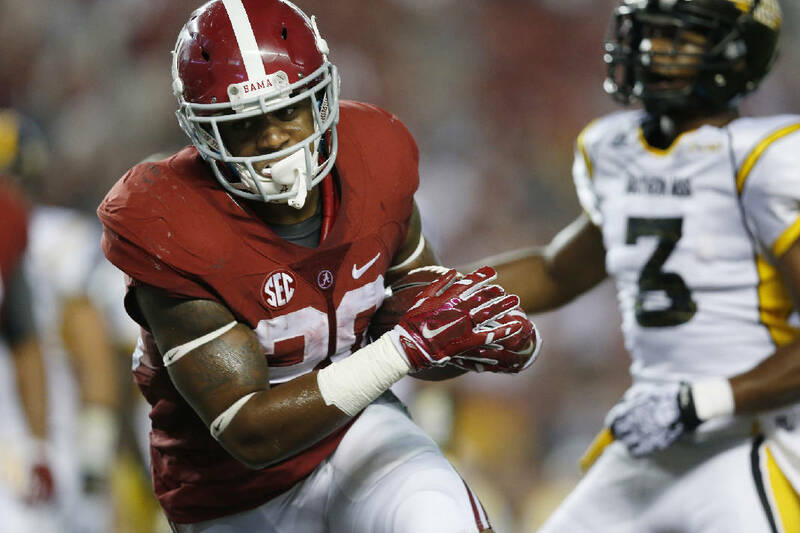 After redshirting with the Tide, Jones showed promise in 2014 with 36 carries for 224 yards. He ranked fourth on the team behind Henry, T.J. Yeldon and quarterback Blake Sims. Jaden Hunter, the No. 8 outside linebacker nationally according to 247Sports, committed to Georgia on Monday afternoon. The 6-3, 218-pound Hunter is from Westlake High in Atlanta and is the son of former Bulldogs receiver Brice Hunter (1992-95), who was shot and killed inside a Chicago apartment in 2004. The Bulldogs remained at 16 commitments, however, because receiver Randrecous Davis from Mays High in Atlanta opened his recruitment. Davis reportedly will decide between South Carolina, which has former Georgia receivers coach McClendon on staff, and Miami, which is now coached by Mark Richt. Davis is the No. 44 receiver nationally according to Rivals and No. 70 according to 247Sports.